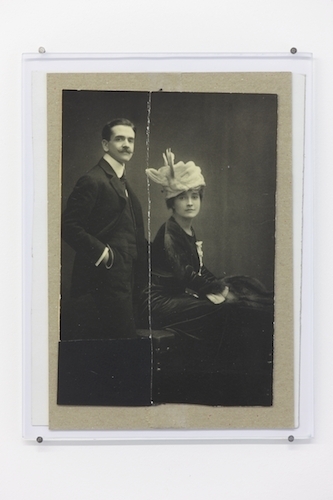 Photograph of Raymond Roussel with Charlotte Dufrène sitting, n.d., altered photograph, 7 x 4 7/8". In “Mon Ame,” 1897, an early poem celebrating his own genius, Raymond Roussel declares: “My soul is a strange machine.” It certainly produced some of the twentieth century’s most peculiar novels and plays: word-game phantasmagorias that prized fantasy over reality. Much to Roussel’s surprise, they were critical and commercial flops (he felt destined to outshine Victor Hugo). But the eccentric writer became a cult hero to the Surrealists and Dadaists, who even brawled defending his works. This sophisticated and transporting exhibition assembles a wealth of rare and previously unseen archival materials, charting Roussel’s work and those it continues to inspire. The show opens with images of Roussel as a young boy dressed in costumes that augur his later, scandal-sparking theater productions, as well as a vitrine of early influences, including volumes by Jules Verne and the astronomer Camille Flammarion. A photograph of Roussel and the woman his mother hired as a public companion for her homosexual son hangs nearby. When the poet John Ashbery was researching Roussel, she cut herself out of the picture and sent him the half with Roussel. (Ashbery eventually reassembled the image and introduced Roussel to the US in the 1960s.) This idea of a ruptured, enigmatic record, pieced together by a passionate few devoted to Roussel, resonates throughout this scholarly show. The torn photograph is visually echoed in Joseph Cornell’s collages, which complement the ephemera, along with artworks by Max Ernst, Marcel Duchamp, and Marcel Broodthaers that riff on themes including dreams, exoticism, and travel. That this gallery, with its roster of contemporary contenders, has chosen to inaugurate its New York space with such a resurrection is a telling gesture, one that feels like a foil for Roussel’s fate. Discouraged and financially ruined by his lack of acclaim, the artist killed himself in 1933 at the age of fifty-six.